You know the basics: eat right, exercise, don’t smoke and achieve a healthy weight. But, going beyond the basics could really put the brakes on heart and vascular disease and have you living a healthier and longer life. It may even get you off some medications and prevent you from needing them in the future. Walnuts: Walnuts contain omega-3 fats and are rich in antioxidants. Research shows just one and a half ounces a day (about a handful) as part of a healthy diet may reduce your risk of heart disease. They have anti-inflammatory properties and also help lower bad LDL cholesterol. Fruits and Vegetables: Aim for at least 5-7 servings a day. Choose from a variety of bright colors including deep blue, purple, orange, yellow, green and red. Fruits and vegetables are rich in vitamins, minerals and many different health-protective phytochemical compounds. 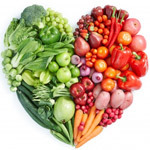 A large 14-year Harvard study found the more fruits and vegetable eaten, the more it reduced heart disease risk. Fatty Fish: Oily fish like salmon, mackerel, herring, sardines and albacore tuna are rich in omega-3 fats DHA and EPA. Studies have found fish oils can help keep heartbeats steady, lower triglycerides, lower blood pressure and reduce the rate at which artery-clogging plaque builds up. The American Heart Association recommends healthy people eat oily fish at least 2 times per week. Almonds: Rich in vitamin E, fiber, antioxidants and healthy fats, almonds may help reduce the risk of heart disease when eaten daily, according to published research. Flaxseeds: The tiny flaxseed contains healthy amounts of both soluble and insoluble fibers and is the best source of plant-based omega-3 fatty acids. Just a couple of tablespoons a day can help reduce cholesterol levels. To receive the greatest benefit from flaxseed, it should be ground. Tea: Green, black or white, whatever you fancy. They all originate from the same plant and are rich in potent antioxidant flavonoids. Research has found that regular consumption of tea may help reduce the risk of heart attack and provide other cardiovascular benefits, such as lowering cholesterol. A minimum of 3 cups a day may be needed for these benefits. Dark Chocolate and Red Wine: Like tea, these items are rich in antioxidant flavonoids which appear to provide cardiovascular health benefits. Moderation is key, however. Excessive consumption of alcohol negates any health benefits. Oatmeal: This whole grain is rich in soluble fiber, which is thought to help reduce cholesterol absorption. Numerous studies support its ability to help lower cholesterol levels. Plant Sterols and Stanols: These occur naturally in small amounts in many plant-based foods. Available in larger amounts in fortified foods, these compounds can help lower total and LDL cholesterol. They can be found in spreads, salad dressings and dietary supplements. Soy: A recent analysis of studies on soy and heart health found it may have little or no effect on heart disease risk after all. The researchers did note that soy may be beneficial when replacing high saturated fat proteins in the diet. It still is a good source of vegetable protein, fiber, polyunsaturated fats, vitamins and minerals. Many health experts recommend choosing minimally processed soy foods such as tofu, soy nuts, tempeh, edamame and miso.